The streetcar routes under consideration in Astoria. ASTORIA — The city is eyeing nearly a dozen Queens streets as potential routes for its $2.5 billion BQX streetcar system, as well as the possibility of new bridges linking Long Island City to north Brooklyn, according to a proposal unveiled Tuesday night. The proposal comes after officials held a series of "visioning sessions" this spring and summer to get public input on the Brooklyn Queens Connector, which would run along waterfront neighborhoods from Astoria to Sunset Park and include 30 stations. Potential routes were chosen based on community feedback as well as factors like infrastructure, proximity to existing bus, ferry and train lines and where traffic would be least impacted, according to the 25-page report. 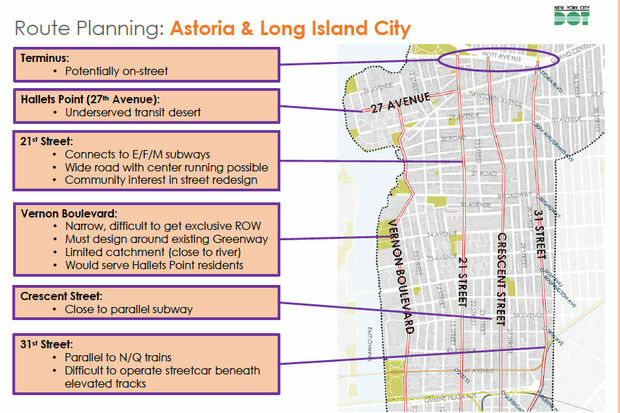 In Astoria, the streetcar line would start and end around Hoyt Avenue near Astoria Park, and may service 27th Avenue on the Hallets Point peninsula where the Astoria Houses are located — an area officials called a "transit desert." From there, possible north-south routes include Vernon Boulevard, 21st Street, Crescent Street and 31st Street, the report shows. The plan notes that Vernon Boulevard would present some challenges because it might be too narrow and is already sharing space with the East River Greenway bicycle path. 21st Street — which transit advocates have been pushing to see redesigned for traffic safety improvements — is being considered because it's a wider path and has connections to the E, F, and M trains, the report says. Crescent and 31st streets would provide direct links to the N/Q train line, though the proposal notes that building the streetcar directly under the elevated train tracks would be difficult. Further south in Long Island City, possible routes may include Jackson Avenue and 44th Drive, which would provide access to the G train at Court Square, according to the report. Heading into Hunters Point, the city is considering either Vernon Boulevard or 11th Street — the first because of its proximity to the 7 train and the area's main commercial hub, and the latter for its width and direct connection to the Pulaski Bridge. Officials are also exploring three locations where the streetcar could cross over Newtown Creek into Brooklyn, either via the Pulaski or at two new spans: one between 2nd Street and Franklin Avenue and the other from Vernon Boulevard to Manhattan Avenue, the report shows. The Department of Transportation, which released the report along with the city's Economic Development Corporation, did not immediately respond to questions about the potential costs of building new bridges over the creek. The agencies expect to hold another round of "community engagement" meetings this fall, and will then release another report on their plans at the start of 2017. City Councilman Costa Constantinides, who represents Astoria, said he sees "pros and cons" for each of the local streets under consideration. "I could look at all four of these red lines and say: 'Here are the good things, here are the bad things,'" he said. But the lawmaker said he would like to see the streetcar run west enough into Astoria that it will be easily accessible to residents closer to the waterfront, where the walk to the nearest N/Q station is a burden for many. He also wants to see that the BQX system is designed with the safety of pedestrians, cyclists and drivers in mind, he said. "We want to make sure whatever street is done, that there is a comprehensive redesign of that street for safety," he said.